Our father among the saints John IV of Constantinople, also known as John the Faster, John the Abstainer, and John Nesteutes, was the 33rd bishop or Patriarch of Constantinople. He is noted for his penitential nomokanon and as the first bishop of Constantinople to assume the title Ecumenical Patriarch. His feast day is on September 2. The date of Joannes' birth is unknown. He probably was born in Constantinople where he was raised by artisan parents. He was not well educated. He became famous for his ascetical life which led to his being called "the Faster". He was a deacon at Hagia Sophia under Patriarch John III (Scholasticus) before becoming a skallarios, that is, an official who was the patriarchal vicar for monasteries. 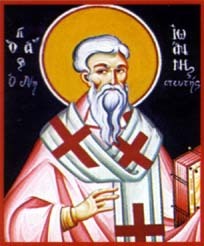 Under Patriarch Eutychius I, who was restored as patriarch, after John Scholasticus died in 577, Joannes became esteemed among the clergy of Constantinople. Upon the death of Eutychius in 582, he was named patriarch as John IV by Emperor Tiberius II on April 11, 582. He remained in the good graces of Emperor Maurice who succeeded Tiberius later in 582. In 588, John IV convened a council in Constantinople to investigate certain charges against Patriarch Gregory of Antioch, of which he was acquitted. The summons to the bishops of the East was done in the name of John IV as Ecumenical Patriarch. While this title, in a context of a compliment, had been used as early as reign of Acacius (471 to 489) in reference to the Patriarch of Constantinople, its use by John IV as a title in documents of his office was a first. The title was used in the acts of the council, to which Pope Pelagius II of Rome objected. Again, in 595, Pope Gregory I, objected to the use of the title, although Gregory previously had been on good terms with John. Patriarch John the Faster reposed on September 2, 595 in Constantinople. Within the Church, John IV is most noted as the compiler of a penitential nomokanon, that is a rule for penances. The rules are instructions for priests on how to hear confessions of secret sins that are either sins of commission or sins of intentions. While old church rules addressed the manner and duration of public penances, it was necessary to adapt these rules for confession of undetected sins. John IV issued his nonokanon so that confessions of sins unknown to the world that testify to the good intentions of the sinner and his conscience in his reconciliation with God are reflected in reduction of penances as established by the ancient Fathers, reductions that amounted to half or more. Also, he defined more exactly the character of the penances, such as severity of fasting, the daily performance of a set number of prostrations, and the distribution of alms. The length of the penances would be determined by the priest. A principal purpose of the nomocanon was to adjust the degree of repentance to reflect the spiritual state of the person who confesses. This page was last edited on October 24, 2012, at 18:03.